Way to rub being single in people’s faces, McDonald’s. 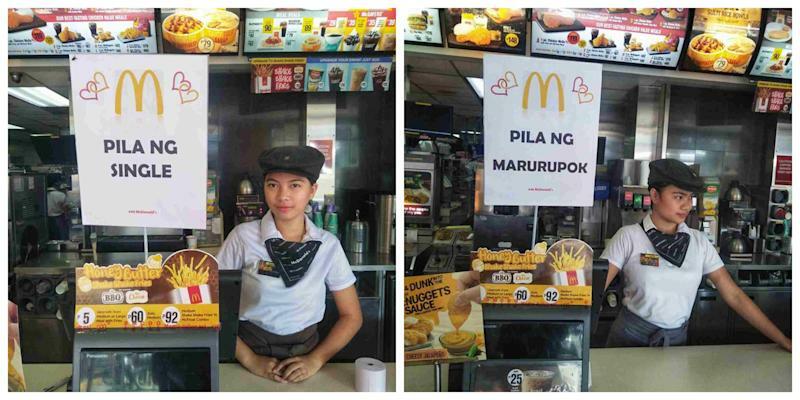 Valentine’s Day is coming up and a McDonald’s branch along Calamba Highway in Laguna province is celebrating it by setting up queues for single, heartbroken, and happily committed customers. The branch’s Facebook page shared a now-viral post yesterday which shows the lines set up by the restaurant’s cashier counters. “Wherever you line up as long as it’s at McDonald’s Calamba Highway, we love you,” it said in its caption in Filipino. The other signs include lines for people who are ready to mingle; those who have loved and gotten hurt; and those who are happily committed or those who already have their “forever” person. While the Facebook post had 162 likes, one of the photos, particularly the photo with the one that says “line for marurupok” received 3,900 likes and 9,500 shares. Marupok literally means “breakable,” but it’s colloquially used to describe someone who easily gets excited over a romantic experience. It’s also used to describe someone easy to get. Netizens thought it was damn hilarious. Jonash Diocolano asked a friend where she’ll line up. Eedyah Admore asked if there’s a line for people who simply don’t care. Where will you line up? Leave a comment below or tweet us @CoconutsManila. This article, LOOK: McDonald’s sets up queues for single, heartbroken, and happily committed customers, originally appeared on Coconuts, Asia's leading alternative media company. Want more Coconuts? Sign up for our newsletters!